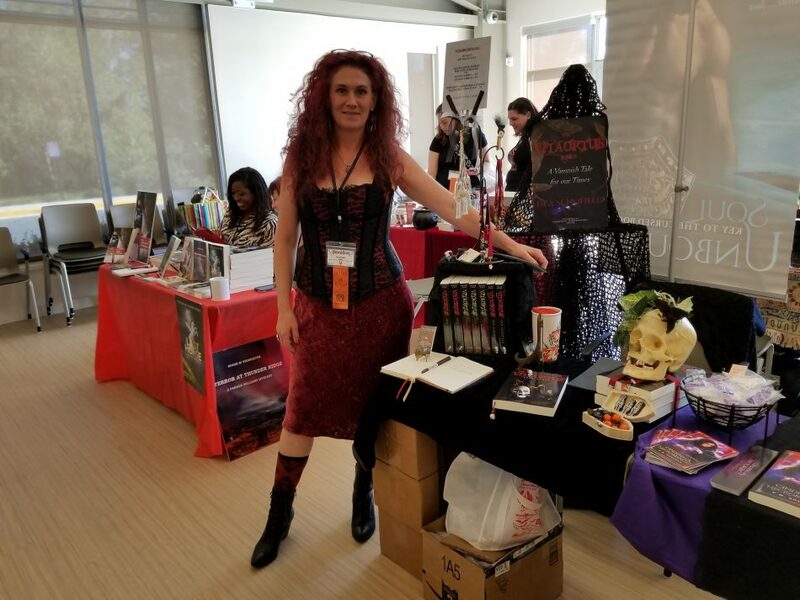 Dea Schofield, author of the Vitaortus series, next to her stall at HallowRead, a book festival and mini-con for paranormal, urban fantasy, steampunk and horror writers and fans at the Roger Carter Center, Ellicott City, MD, October 21, 2017. Picture: Shannel Barnhill. Vitaortus is the first of a trilogy [series -ed.] by Dea Schofield and takes an unusual walk through vampire lore. Set in modern America (primarily) we meet Lord Alexander Gregory, or Alec, hunting a stag on his estate in the form of a wolf. Alec has forgone hunting humans, though he will still consume human blood and kill when the occasion demands it, however like many vampires he has drunk tainted (by the poisons of modern living) blood and it has limited his powers and he has, slowly, begun to age again. The impact on his shapeshifting is that it can’t be maintained for very long. Next we meet Devi Trevathan—a young looking horticulturalist with her own secret—she is over a hundred years old, though she doesn’t know why. 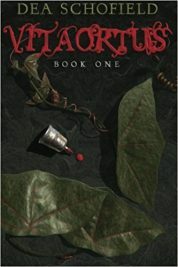 An associate of Alec gives her three mysterious seeds for a plant called Vitaortus. When she proves able to cultivate it, she is drawn into their world. She is a Prime Channel, supernaturally aligned to the earth and able to encourage the plant to grow. The plant itself will allow a substitute within their diet and her blood proves not only to be (on a pinprick level) a necessary food for the plants but also a source of potent healing for the vampires—making Devi very valuable indeed. The primary powers that the vampires maintain (beyond strength and speed) is mesmerism – the modern pollutants do not seem to have effected that power. Older vampires (who are not weakened) can walk in the sunlight briefly. There are good and bad vampires out there including several strains of vampirism, it seems. The book is more an establishing volume than anything. We have a brief Mexican adventure, which adds in some vampires that would seem to be another species (the Camazotz being rather bat-like and based on the bat-god of Mayan myth). In this Devi is kidnapped briefly but is treated well, donates blood and is returned to her protectors once the Camazotz’ Queen begins to heal through her blood. That sojourn also underlines Devi’s not violent nature. We also briefly meet a human right-wing organisation, briefly, and a rival vampire whose sorcery makes him, possibly, more powerful than Alec. If I had a (very minor) complaint it’s that there was very little in a sense of peril in this volume. I am sure it will increase in future volumes, however, and the book was eminently readable. Some of the dialogue came across as a little stilted, but again there was no barrier to enjoying the book and it was only occasional and is one of the more difficult things for an author to get consistently right. I expect that this will be less and less of an issue as we move through the volumes and, positively, the characters all had their own voices. However, it is the interesting plant premise at the heart of this that makes the book. Unusual lore, taking genre staples and then creating the author’s own rules and imaginative concepts and merging them seamlessly together. 7.5 out of 10. October 25, 2017: The title of this article was originally “‘An Unusual Walk Through Vampire Lore’: The First Book in Dea Schofield’s Vitaortus Trilogy,” and the author’s photo was captioned “Dea Schofield, author of the Vitaortus trilogy.” The author has informed me that there are actually five books planned in the series, not three (three instalments are currently available), so I have changed “trilogy” to “series” where appropriate. I apologise for the error. –ed. Vitaortus: Book One, is available on Amazon in paperback and Kindle formats. 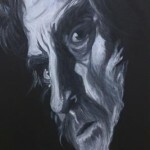 You can reach Dea on Facebook, Twitter or visit her website: http://vitaortus.com/.